looking to put 6 ccts (lighting) on a contactor controlled by a time clock. I'm kinda new, and not sure how to go about it. are there 6 pole contactors? 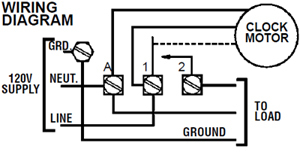 Check 30-710(4) for the rating of the contactor. Appendix B refers to CSA C22.2 #14, which means nothing to me, but it might allow for a lower rating if the contactor is rated in HP. The rule is that for HID lighting, the rating must be double the ampere load. ASCO makes lighting contactors with as many poles as you need. A mere 6 poles should be no problem at all. thanks! 2 - 3pole contactors will work. Now, installing the time clock. There are 4 terminals, 2 line, 2 load. I'll parallel up the coils, but I don't see where I would need 2 wires in and 2 out for the time clock. I seem to remember there being a removable bridge in the time clock. Do I just remove this to have the 2 lines in so it acts like a switch for the contactors? But it must need power all the time to function, so ...... where does that come from? the contactors are the load side? The feed phase wire from the supply would go to one of the Line terminals, the other Line terminal will be for the neutral, this will often have a link between the line and load side of the time switch, use a meter to confirm this though. Connect your contactors to the Load side of the time switch.